The Central Bank of Ireland officially launched their latest collector coin on Wednesday 12th December when they presented the first example of the last “Animal Coin” to the President of the NUI of Galway in a ceremony attended by both university officials along with those from the Central Bank. With the historical city of Galway as a backdrop, Ireland’s fourth most populous city which lies on the River Corrib, and is often referred to as “Ireland’s cultural heart”. Home to many medieval ruins including Lynch’s Castle and St. Nicholas Collegiate Church, the country’s largest medieval church still in everyday use in Ireland. It was founded in 1320 and enlarged in the following two centuries. Legend has it that Christopher Columbus himself prayed in this Church in 1477 when he visited the town. The first “Hound” coin struck with “0001” certificate is presented to President James Brown by Governor Patrick Honohan. 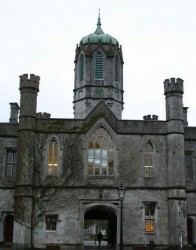 The inner courtyard of the NUI, Galway, the main clock tower is seen from every vantage point within the courtyard. 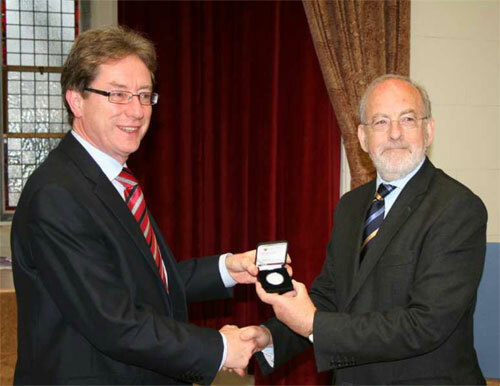 Presiding over the ceremony, was the Central Bank of Ireland’s governor, Patrick Honohan along with the President of the 163 year old university, Mr James Brown. The presentation itself was held in the recently refurbished Aula Maxima – at the heart of the historic Quadrangle Building in NUI Galway. This was the original building of the University which was founded in 1845 and welcomed its first students in 1849. The presentation was in recognition of the Central Bank’s recent commission meeting in Galway. This meeting, which was unprecedented since these regular policy & review meetings are always held in Dublin. Mr. Honohan concluded his speech by thanking Dr. James J. Browne, President of NUI Galway for hosting today’s events and for the warm welcome that the Central Bank and their representatives received. With those comments, the first “hound” coin was presented to Mr. Brown and in return, Mr. Honohan was presented with a hand-printed limited edition etching of “The Quadrangle, NUI Galway”. It was made by the artist John McNulty in his studio in County Mayo. The Print was commissioned earlier this year with the first print itself being given to the President of Ireland, Michael D. Higgins – a graduate of Galway University himself. 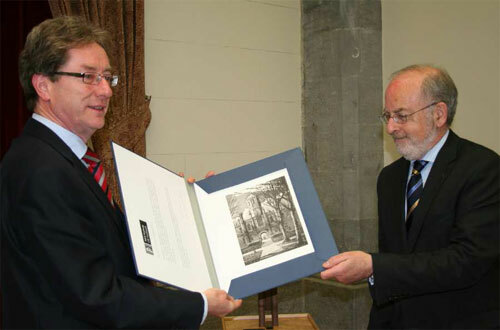 In return, Mr. Honohan is presented with a limited edition lithograph print of the University’s well-known 165 year old structure. As part of the recent commission meeting in Galway, the Central Bank was invited to organize the launch of the final “Animal coin” along with the participation of the University of Galway. The Animal series, a collection of farm & domestic animals familiar to Ireland and designed by famed medallic and coin artist Percy Metcalfe first appeared on Irish Republic coins beginning in 1928. The designs were well received by the Irish public and eventually became quite popular with collectors around the world. The designs were in continued use until the adoption of the EURO single currency by the Republic of Ireland in 2002. The enhanced designs, with additional elements added by artist Emmet Mullins, were first introduced to collectors in 2010. The re-emergence of these favorite designs on EURO coinage is in recognition of two aspects of Irish coinage. First, that the designs themselves should appear on EURO coinage and thus, have now transitioned from pounds, shillings, pence to decimal coinage in 1971 and finally the EURO system. Second, that the EURO represents the next generation of currency introduced in Ireland since independence. The depiction of a colt, a smolt and a pup on these coins along with the adult animal represents this next generation. The “Hound” coin is now available to interested collectors. A mintage of 8,000 pieces makes this coin the smallest quantity minted in the series. The Central Bank of Ireland is already at work planning for the 2013 collector coins calendar. Among those events planned for issue include a new EUROPA silver star issue as well as marking the 50th anniversary of President John Kennedy’s historic visit to Ireland in June 1963. For more information on these and other coins offered by the Central Bank of Ireland, please visit their website at: http://www.centralbank.ie/paycurr/collector/Pages/Coinsets.aspx International orders fulfilled.